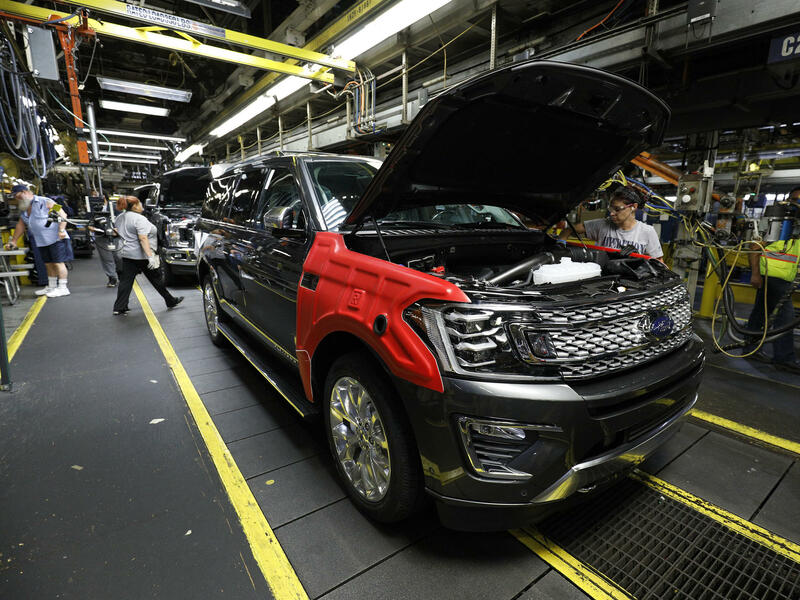 A 2018 Ford Expedition goes through the assembly line at a Ford plant Oct. 27, in Louisville, Ky. Higher-profit SUVs and trucks are making up a larger share of auto sales, boosting the industry's fortunes. Scarpelli, a Chicago area car dealer, says normally he'd be worried about a forecast for slowing sales. But, he says, the industry is much healthier now than anytime he's seen it. "They don't have large inventories parked in storage lots like they used to," Scarpelli says. He points to leaner plants, better-quality vehicles, and the cutting of labor and marketing costs as signs of an improved industry. And that goes for dealers too, Scarpelli says. "We have made sure that we keep our budgets in line — marketing, inventory, handling costs," he says. Here's another reason the industry is doing well: consumers are buying SUVs and trucks, which tend to have higher price tags and bring much larger profits. The switch to the larger vehicles is a "seismic change in our industry and people's wants and needs," Scarpelli says. Kristin Dziczek with the Center for Automotive Research says the biggest of those checks ($11,750) are a sign of the industry's health. For some workers, that check represents as much as 30 percent of their take-home pay. But she says profit-sharing or bonuses as opposed to raises "allows for the downturn to not be as rough as it might have otherwise been." The companies can cut costs or make production changes without first resorting to massive layoffs. But Dziczek says the industry does have some things to be worried about: climbing auto loan defaults and rising gas prices. Nevertheless, she says car companies are "much, much, more ready to weather" a sales downturn. Jessica Caldwell, an analyst with Edmunds.com, agrees. She says the car companies have become nimbler and more responsive to consumer tastes, shifting to profit off the SUV craze that began in the U.S. this decade. "Most companies have acted quickly to get as many products that match the market demands on the road, whereas I'd say maybe 15 years ago that necessarily wouldn't be the case," she says. Caldwell says today's SUVs are more fuel efficient, making them more immune to higher gas prices. And she says the companies are in a very good position to survive a slowdown or even a recession. But Caldwell says the challenges posed by new technology like the self-driving car are making automakers worry. "I think the fears before were things like market share ... or how can I weather the next economic downturn in the economic cycle?" says Caldwell. Now the question, is "can they stay relevant in the next two decades," she says. 2017 was yet another good year for the auto industry, but this year may not be as strong. Automakers report February sales today, and analysts are predicting sales will remain flat after years of strong growth. But NPR's Sonari Glinton reports that the auto industry is in better shape to survive the next economic downturn. SONARI GLINTON, BYLINE: Things have been good in the car industry for quite a while. 2017 was one of the best years ever, but it was a comedown from all-time records. MARK SCARPELLI: I can tell you that coming off a plateau in the last couple years for sure. GLINTON: That's Mark Scarpelli. Now, he runs the Raymond Auto Group, a group of dealerships in the Chicago suburbs, with his father Raymond Sr. and his brother Raymond Jr. Scarpelli says with the forecast for slowing sales for 2018, normally he'd be worried. But he says the car companies are making much more money off of each car. They cut labor costs. They're more efficient. All that has caught on, he says. SCARPELLI: Same could go for local automobile dealers such as ours. We have made sure that we keep our budgets in line - marketing, inventory, handling costs. You know, we carry what we need. We don't go in excess to carry things on our lot. GLINTON: Scarpelli says one of the reasons the industry is doing well is that the customers are buying SUV and trucks, and those are really profitable. SCARPELLI: You know, there has been a seismic change in our industry in people's wants and needs. You know, a few years back, the sedan or a coupe was quite popular. GLINTON: All that cash coming in from SUVs and trucks means that employees of General Motors, Ford and Fiat Chrysler group all took home fat profit-sharing checks. Kristin Dziczek is with the Center for Automotive Research. KRISTIN DZICZEK: I'm just going to pull up my profit-sharing spreadsheet here, if you don't mind, to put it in some perspective of where we've been over time. Just take a second here - sorry. DZICZEK: They're much, much more ready to weather a downturn in automotive sales. GLINTON: Jessica Caldwell is an analyst with edmunds.com. She says the car companies have become nimbler and more responsive to consumer tastes. Caldwell says today's SUVs are more fuel efficient, making them more immune to the price at the pump. She says car companies are in a very good position to survive a downturn or even a recession. But coming changes in technology, the self-driving car thing, that could be a whole different story. JESSICA CALDWELL: And now we're looking at something that's so much larger. You know, can my business essentially stay relevant in the next two decades? Which I don't think was ever a fear in the past 20 years. GLINTON: Apparently, the car business can't take anything for granted - not anymore. (SOUNDBITE OF TIDES FROM NEBULA'S "HIGGS BOSON") Transcript provided by NPR, Copyright NPR.